that I like to consider to be the final frame of the movie. 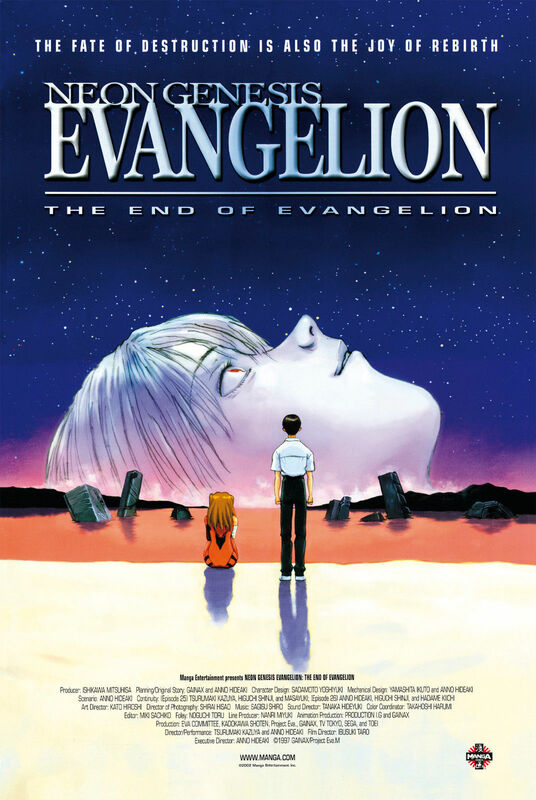 In contrast with Shinji crying on top of Asuka, which is certainly thought provoking considering everything that lead up to that scene, this cover art emphasizes the overall message of hope. But what I like the most about it is the amount of details that are open to interpretation, making me appreciate the depth Evangelion is so known for. Let's look at the scenery - we can see dark mountain and debris in the distance, obstacles that lay ahead of the characters to overcome, but they are no longer laying down, but are standing firmly on bright sand, like a blank page of possibilities they can go left, right, down without anything blocking them. They are free to choose their own path instead of having someone force one on them. Shinji is standing tall, literally and figuratively, he is not looking down or away from what lies ahead. His hands are clenched in fists, a sign of inner strength, resolve. He steps out of Asuka's shadow in terms of confidence. Asuka is sitting with her knees to her chest or cradling her arms in her lap, she looks vulnerable, doesn't this all seem uncharacteristic at first? Like a role reversal. Typically, we would picture Asuka in her confident pose of feet slightly apart, hands on her sides, her chin up. This illustrates just how much things have changed after the characters have experienced instrumentality. While the source of the bandages is unknown, the symbolism is clearer - we know physically her wounds have healed because she is able to move her hand despite such a grievous injury, but Asuka doesn't perceive herself as fully healed yet. She is wearing her plug-suit, but her signature A10 nerve clips seem to be absent, indicating that she at least begins identifying herself as more than just an eva pilot. I've always thought it interesting that the cover art for the DVD would chronologically take place some undetermined amount of time AFTER the end of the film. Which therein begs the question: Is that drawing considered canon?